^ a b Stone, Larry (1999). Randy Johnson, Arizona Heat!. United States: Sports Publishing L.L.C. pp. p. 15.. ISBN 9781582610429. http://books.google.co.jp/books?id=AWhhedsJQF0C&pg=PA15&dq#v=onepage&q=&f=false. ^ May 16, 1993 Seattle Mariners at Oakland Athletics Box Score and Play by Play - Baseball-Reference.com 2008年1月11日閲覧. ^ Seattle Mariners Pitching Leaders - Baseball-Reference.com 2008年1月11日閲覧. ^ Baseball Awards Voting for 1993 - Baseball-Reference.com 2008年1月11日閲覧. ^ Single-Season Leaders & Records for Won-Loss % - Baseball-Reference.com 2008年1月11日閲覧. ^ Baseball Awards Voting for 1997 - Baseball-Reference.com 2008年1月11日閲覧. 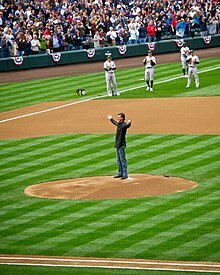 ^ Randy Johnson 1998 Pitching Gamelogs -Baseball-Reference PI 2008年1月11日閲覧. 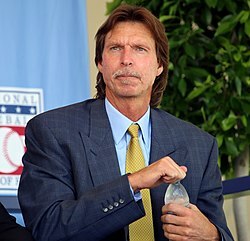 ^ Randy Johnson 2003 Batting Gamelogs - Baseball-Reference PI 2008年1月11日閲覧.